' 2018 General Conference LDS Apostle and Prophet Printable Cards - Sisters, What! *this post may contain affiliate links at no extra cost to you. Thanks for supporting Sisters, What! This post is a little different from most of my posts on here, but I spent so much time creating these flashcards I felt I needed to share them with those who might also want some. And if you have no idea who these people are, I invite you to keep reading to learn a little about them and also learn a little more about me. First off, I belong the Church of Jesus Christ of Latter Day Saints. It is a big part of who I am and why I do what I do on a daily basis. I most definitely am not a perfect example of how a Latter-Day saint, but that is one thing I love about being a Latter Day Saint. We are taught to strive to be the best person we are capable of being and if we have a rough day, we can try again the next day, and the next, etc…This philosophy has totally influenced my creative endeavors; if I mess up on a craft or a project, I might get discouraged but I know I can try again and keep working at it. I’m far from being a perfectionist, but I keep striving every day and slowly I hope that I am getting better. Anyway, twice a year in April and October, we have a General Conference where we have the opportunity to hear from our church leaders in Utah – a Latter Day Prophet and Apostles. Because of modern technology, we are so blessed that we can watch it in the comfort of our own homes. Such a blessing with little kids. We get to hear them share inspiring talks and stories that give us a extra boost to help us in our daily life. 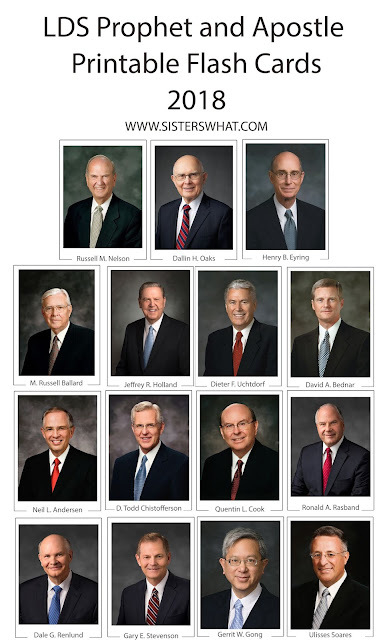 I know I’m not the only one to say this, but General Conference is my favorite time of year because of these inspiring talks. And as a mother, I have come to cherish the council given more than I did before. There are so many sources of self-help out there, but to me this is the best I’ve ever heard. ANYONE can listen, whether you are a member of the church or not. It is this weekend both Saturday and Sunday. Check out LDS.org for more information and to tune in. If you think you have friends who would be interested in these flashcards, please share this blog post link with them. I recommend laminating them so they last longer. The cards can be single sided, or you can make them double sided with information for each Apostle on the back. I added the date they were ordained so you can even try to see who can match them up based on seniority. We always put the cards on our magnetic board and move them to another board to keep track of who has spoken. I hope you enjoy them! I’d love to see how you use them, just tag us @sisterswhat or email me sisterswhat @ gmail .com.